It is commonly thought, that French cuisine or French-inspired cuisine is super formal and rather stuffy. This doesn’t have to be the case. Coup des Tartes in Central Phoenix and it’s owner Ron Pacioni are looking change this stigma and turn it on its head. Coup des Tartes refers to itself as “French bistro-style restaurant reminiscent of la belle epoque and the Roaring ‘20s, Paris-style.” We recently visited during a media dinner and were treated to a range of delights from their menu. 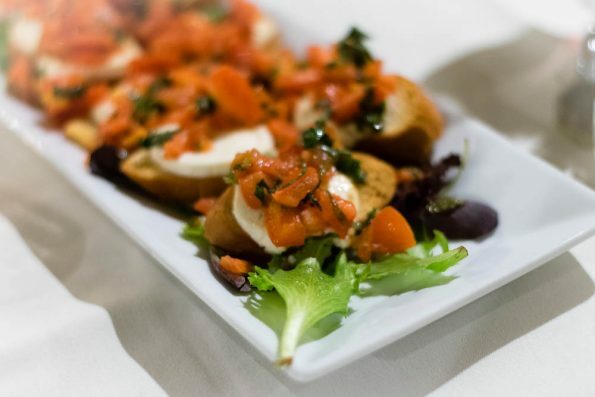 Chevre Tomate (Warm goat cheese and tomatoes on toast)- A French take on classic bruschetta, the chevre in this dish is delightfully light and full of flavor. The acidity of the tomatoes balances the aforementioned cheese and creates a tasty bite perfect for the start of a meal. 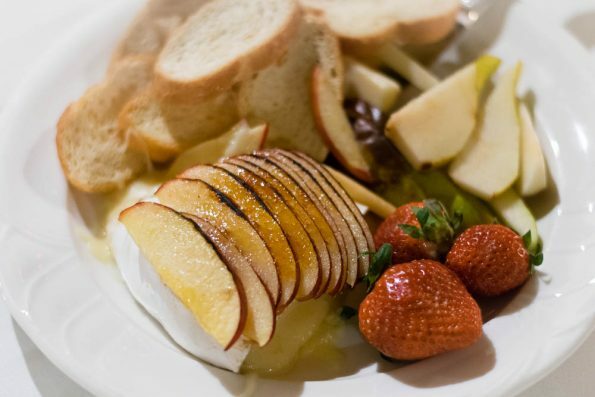 Brie Brulee (Warm Brie cheese topped with caramelized apple, served with toasts and seasonal fruit)- Anytime you can get warm Brie you are in for a treat. What was especially unique and interesting about the Brie Brulee at Coup des Tartes was the apple topping rather than a compote of some sort. Not only was it unique, but delicious as well. 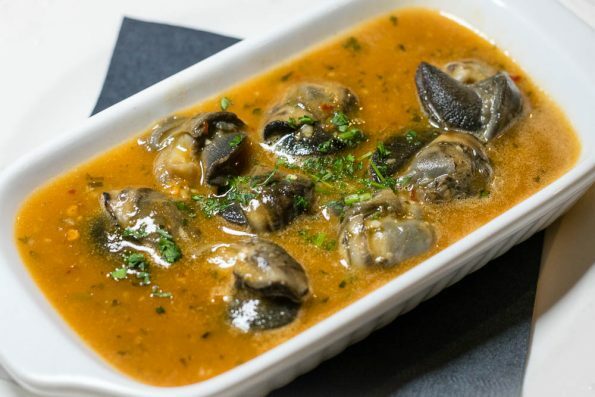 Escargot (Snails with confit garlic herb butter, lemon)- We love Escargot! We will eat it whenever we get the chance and Coup des Tartes did not disappoint! Full of the garlicky butter flavor you expect when eating escargot, this is a must order for adventurous diners and new foodies alike. 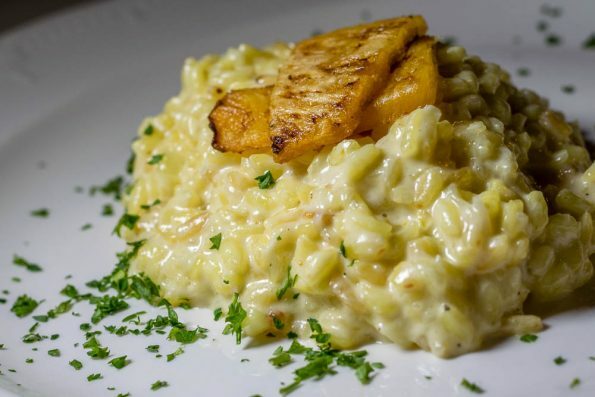 Risotto (Curry, charred pineapple, and crispy coconut)- Risotto is one of those foods that can be so easily messed up. Fortunately Coup Des Tartes’ chef Jose Hernandez knows how to do risotto properly. Additionally, this dish has one of the most unique flavor profiles we’ve had in a risotto. No stuffiness here folks. Where you’d expect wine and butter, you get an exotic tropical flavor that just melts in your mouth. 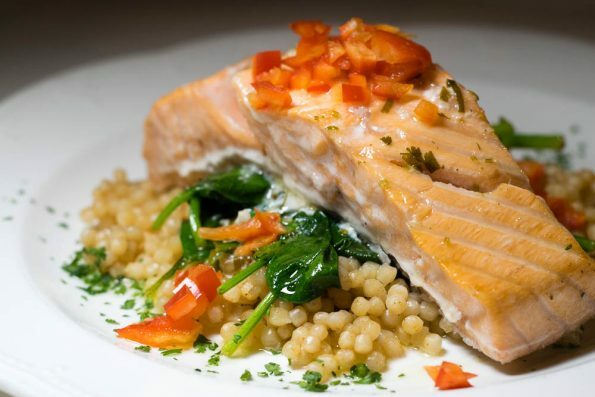 Salmon (Sauteed spinach, couscous, roasted garlic, lemon and cilantro butter sauce, topped with fresh red bell pepper)- Recently, we’ve had a slew of delicious salmon dishes and this one is getting added to that list. The salmon was cooked perfectly and was not dry in the slightest. The couscous packed a punch and was loaded with lemony flavor. 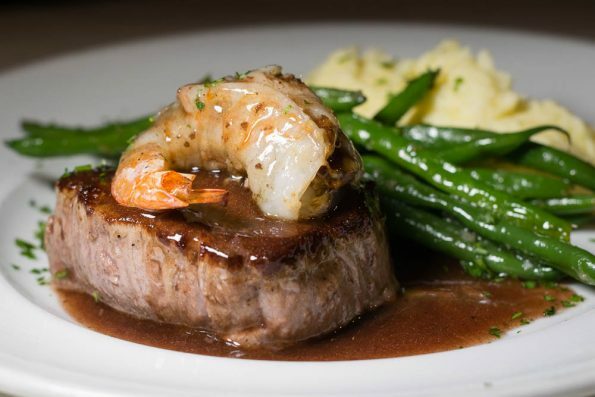 Crab Stuffed Shrimp and Filet Mignon Duet (Merlot reduction, mashed potatoes, and haricot verts)- While you’d expect to see a filet mignon on a french inspired menu, the crab stuffed shrimp added that special touch that Coup des Tartes does best. The merlot reduction was also delicious, especially with the mashed potatoes. 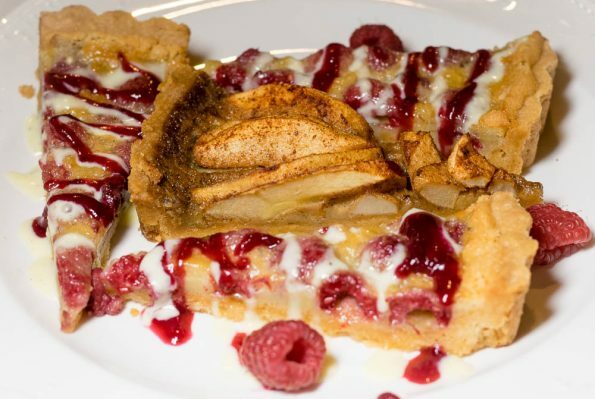 Raspberry Studded Brown Butter Tarte (Rich browned butter and vanilla custard with fresh raspberries, baked in a light pate sucre and served with raspberry coulis and creme Anglaise)- If you aren’t a chocolate lover, this dessert is totally for you. Rich and delicious, but not overly so. The tartness of the raspberries and the creaminess of the vanilla custard are the perfect compliments for one another. Triple Chocolate Mousse Cake (Rich, flourless chocolate cake layered with dark chocolate and white chocolate mousse, served with chocolate ribbons, and fresh strawberries)- Gluten free dessert lovers rejoice! Coup des Tartes has you covered. You too can enjoy a deliciously decadent dessert that is jam packed with chocolatey goodness. White Chocolate Lime Mousse Tarte (White chocolate infused with fresh lime zest in a macadamia nut crust and served with an exotic coconut ginger sauce)- In our opinion, the most delicious dessert of the evening was the White Chocolate Lime Mousse Tarte. The lime flavor permeated the tarte and was simple yet exquisite. We may be biased due to our love of citrus desserts, but it was truly fantastic. Creme Brulee (French classic custard dessert)- The quintessential French dessert. 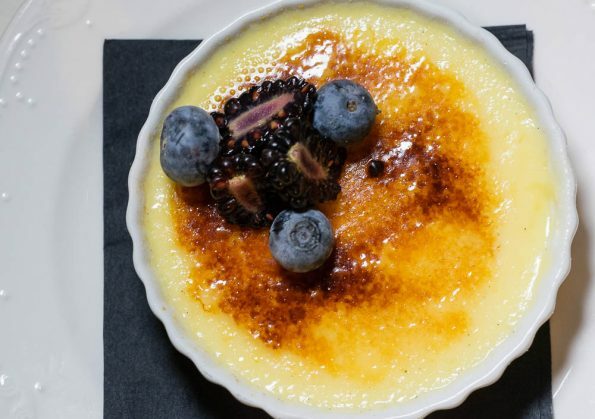 If you are looking for a traditional French inspired dessert, you won’t be disappointed with this Creme Brulee. Though honestly, have you ever met a Creme Brulee you didn’t like? We haven’t. In addition to all of the wonderful food, Coup des Tartes hosts a plethora of fun events such as Murder Mystery Dinners and Princess Tea Parties. Once you’ve gone to Coup des Tartes you’d be hard pressed to call them stuffy which is exactly what Ron Pacioni is going for. Have you visited Coup des Tartes? What was your favorite menu item? Leave a comment below or use the hashtag #GeekEats.